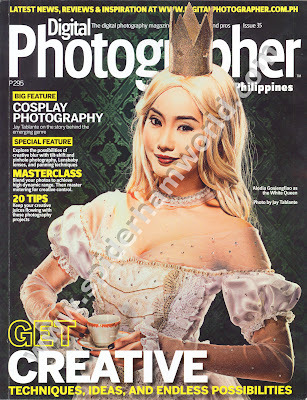 Digital Photographer Philippines (DPP) features Alodia Gosiengfiao in the cover in their issue number 35 cover. This issue discusses all about Cosplay Photography and showcases some celebrities portraying famous comic or movie characters. Besides Alodia's sister, Ashley, some of the celebrities featured in this issue are Diana Menezes, Bianca King, Paolo Paraiso, Bubbles Paraiso and Rhian Ramos. This issue also includes a feature special of Creative Blurs with guides about tilt-shift lenses, Lensbabies, pinhole photography, and panning techniques. okay! let's set this photo shoot! Naintriga ako bigla kay Emong Dakuskos..